Big Effin Blue. The Giants have done the impossible. Three straight playoff road wins and a NFL record 11 straight road wins overall. It was a total team effort, strong and determined, similar to the display put on by the NYC Food Guy and friends as they feasted, at work, during the game. 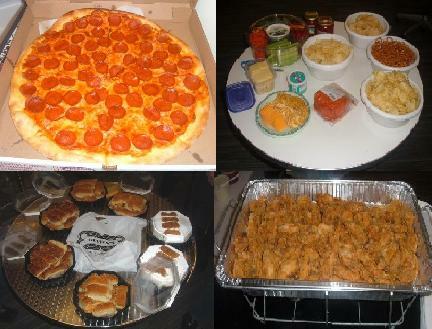 Amazing wings, greasy pizza, corn and potato chips, fresh veggies, 2 kinds of dip, salsa, Morton’s steak sandwiches.